Roberts’ Horse - action at Eerstefabrieken 31August 1900? TOPIC:	Roberts’ Horse - action at Eerstefabrieken 31August 1900? 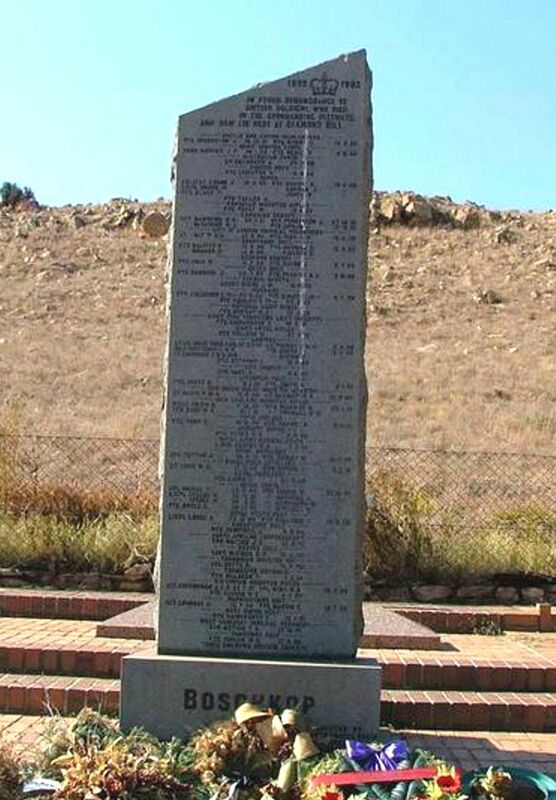 I am researching the individuals named on the A-B war memorial in Oudtshoorn. In this connection I am trying to locate details of an action involving Roberts' Horse at Eerstefabrieken which resulted in the wounding of 1238 Pvt. W. B. Yorke, on 31 August 1900 and his subsequent death on 1st or 2nd September 1900. Can anyone shed any light? Many thanks. Although there were some 50+ British casualties countrywide on 31 August 1900, the Yorke incident seems to be a "one-of". Probably a lucky shot by a Boer sniper. Henk, many thanks for that. 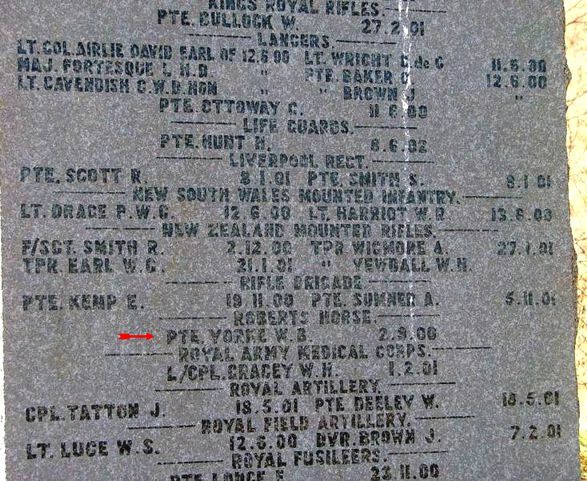 One of those 'we'll never know"s.
His name appears on the British Memorial at Diamond Hill near Cullinan. Proceeding from Tweefontein on August 18 , under orders to refit in Pretoria, General Hart's force reached Krugersdorp at noon on August 23. Here the Royal Canadian Regiment was detached from the force and sent by train to Pretoria, whence,on the following day, it marched out to assume line of communication duties at Silverton and Eerste Fabrieken , two stations to the east of Pretoria. Three companies, under Major Pelletier , were stationed at Silverton and four under Liet-Col. Otter, at Eerste Fabrieken . "G" Coy was still on duty with the armoured train on the Kroonstad-Pretoria line. Without notable incident , the unit carried out its duties in these locations until September 2 , when four companies under Major Pelletier , were ordered to Olifant's River. "D" Coy was thereupon transferred from Eerste Fabrieken to Silverton, the station there being placed under the command of H.B Stairs. But Pretoria brought the men no news of their release from service, only orders to resume garrison duty east of Pretoria, at Silverton and Eerste Fabrieken , to the east of the Delagoa Bay railway.The day before he left Springs, Otter had posted Buchan, his popular second in command, and G Company to the convalescent camp at Elandsfontein. Major Pelletier , with the rest of the eastern Canadians , went to Silverton, with a troop of Roberts' Horse and a section of the 18th Battery of the Royal Filed Artillery .Otter kept the larger station , Eerste Fabrieken , for himself, together with A, B, C and D companies, with a troop of Roberts' Horse for patrol duty. Eight days later Pelletier and E, F and C Companies were sent to Olifants River, a tributary of the Limpopo about fifty miles away , and perhaps the most demanding of the three Canadian garrisons, while Captain Stairs remained at Eerste Fabrieken with only A and B Companies. At none of these stations was garrison duty onerous. Defences were in place, and though small parties of Boer Commandos hovered about , threatening to cut the Pretoria-Middelburg railway line over which large troops and supplies passed to and from the army's headquarters in Pretoria, there was little action. Yorke was more than likely on patrol , when he encountered a small Boer force, or was shot by a sniper as Henk suggested . Elmarie, Many thanks for the photos. Nice to have been commemorated in two places!